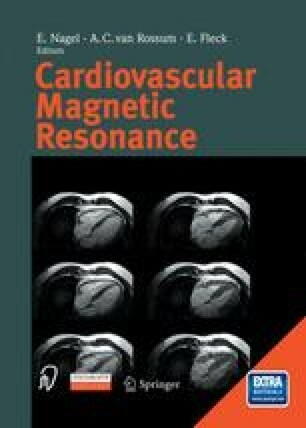 In clinical routine, the use of magnetic resonance imaging for the morphological or functional diagnosis of cardiovascular diseases has been mainly restricted to patients with complex congenital heart disease, diseases of the thoracical vessels and the pericardium, cardiac tumors and cardiomyopathies . Today, technical improvements allow clinically important questions in patients with coronary heart disease to be answered using this technique as well. Since the publication of the Task Force Report of the European Society of Cardiology  which is summarized in Table 9.1 the spectrum of indications has expanded considerably. These new indications are elaborated in Table 9.1. For some indications cardiovascular magnetic resonance imaging can be regarded as the reference standard today. This chapter contains an overview for potential diagnostic questions and the diagnostic accuracy achievable with magnetic resonance techniques. A detailed description and a discussion including additional reading and original literature is found in each chapter of the book.